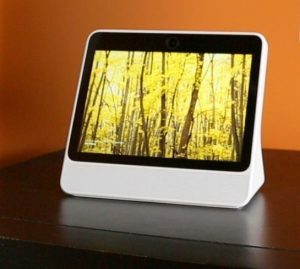 Facebook Inc. (NASDAQ: FB) has debuted its new Portal products, a line of smart displays enhanced for video calling. The company says that the Portal is designed to bring you closer to your closest Facebook contacts, providing you with an experience that makes you feel like you are there with them. The company has also released pricing for the new devices. The standard Portal smart displays will cost $199 while the Portal Plus will set you back $349. The primary function of the devices is video calling between Facebook contacts. Portal video calling is accessible exclusively to users of the Facebook Messenger text and video chat service. Your contacts don’t need a Portal of their own to receive a call. Setting up the device is easy and takes just a few minutes. There are prompts on the screen to configure it by signing into your Facebook account, entering a code on the Portal, and entering the Wi-Fi info. Your Portal homepage contains your list of Facebook friends and a separate section for your “favorites”. You can initiate a video call with the touchscreen or saying “Hey Portal” to activate the voice assistant. The Portal camera has a 140-degree field of view to give an expanded look at the caller’s environment. Anyone chatting with loved ones that are far away will appreciate the illusion of being in the same room with them. The camera can automatically adjust to concentrate on the person in the frame. When there are multiple people on screen, a feature called Spotlight has the camera focus on a specific person. The expansive view increases the sense of closeness to make you feel like you’re there. Some people might be concerned about allowing Facebook to put a device containing a microphone and camera in their home. The company has not had the best reputation on the customer privacy front lately. Privacy concerns have sparked several investigations and congressional hearings over the past year. Back in March, Facebook disclosed that UK-based data analytics firm Cambridge Analytica had improperly used the data of millions of Facebook customers, causing an international uproar. Since then, two more significant data breaches have struck the company. Concerns about privacy may hinder widespread adoption of the devices, but if Facebook can alleviate these concerns, they may be able to convince some of their hundreds of millions of users that the Portal is a device they need.